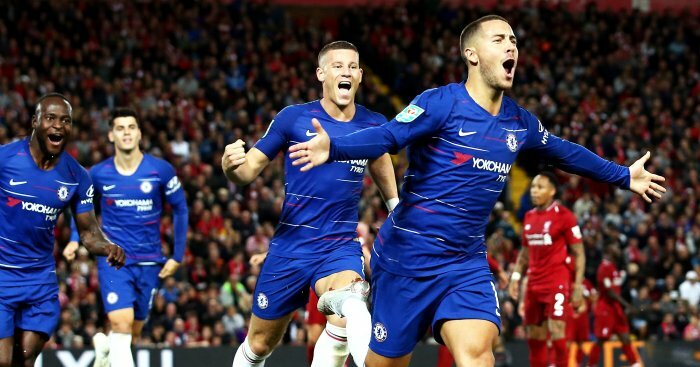 Substitute Eden Hazard scored a brilliant winner as Chelsea defeated Liverpool 2-1 in the Carabao Cup third round at Anfield. The Reds’ seven-match winning start to the season was halted after Hazard fired past Simon Mignolet in the 85th minute at the end of a wonderful run. Hazard’s goal came six minutes minutes after he helped create Emerson Palmieri’s equaliser, which cancelled out Daniel Sturridge’s 58th-minute opener. The first of two meetings between the clubs this week, with a Premier League clash at Stamford Bridge to come on Saturday, saw Liverpool boss Jurgen Klopp and Blues counterpart Maurizio Sarri both make eight changes to their starting line-ups. The visitors made a lively start, during which Alvaro Morata was twice thwarted by Mignolet, before Liverpool began to find some rhythm. Cries for a penalty rang out from the stands just after the half-hour mark when Naby Keita hit the turf under pressure from Gary Cahill – but referee Kevin Friend allowed play to continue. It appeared any contact between the pair had been minimal, and Cahill made it clear he was unhappy with the way in which Keita had gone down. There were more unsuccessful penalty appeals from Liverpool supporters moments later as Cesc Fabregas was deemed not guilty of handball. Keita then unleashed a fierce strike that brought a fine save out of Willy Caballero, who subsequently saved a Sadio Mane header. Liverpool looked set to grab the lead less than a minute into the second half when Sturridge latched on to a poor attempt at a backpass by Andreas Christensen, tried to get around Caballero and was presented with an open goal, but he could only shoot wide. Check all the stats here with TEAMtalk. Morata then sent a header over before Chelsea survived another lapse at the back, with Ross Barkley heading towards his own goal and Mane’s effort going wide off Caballero. Chelsea were punished for more defensive sloppiness soon after as they lost possession, the ball came to Keita and after his shot was parried by Caballero, Sturridge followed up with an acrobatic finish. The away side levelled when Hazard, introduced two minutes before Sturridge’s goal, delivered a free-kick into the Liverpool box, Barkley’s header was palmed away by Mignolet and Emerson prodded in. The incident went to a VAR review for offside before the final decision was made that the goal should stand. Sturridge then curled a shot against the crossbar, before Hazard’s piece of magic sent Sarri’s men through – as he beat a host of home players on a mesmerising run before slamming the ball beyond Mignolet.